The year 2006 marked the 100th anniversary of the birth of Kurt Gödel (1906–78), the foremost mathematical logician of the twentieth century. Looking back over that century in the year 2000, TIME magazine included Gödel among its top 100 most influential thinkers. Gödel was associated with the Institute for Advanced Study from his first visit in the academic year 1933–34, until his death in 1978. He was Professor in the School of Mathematics from 1953 until 1976, when he became Professor Emeritus. Kurt Friedrich Gödel was born on April 28, 1906, in what is now Brno in the Czech Republic. His father, Rudolf Gödel, was originally from Vienna; his mother, Marianne Handschuh, came from the German Rhineland. Rudolf Gödel managed and was part owner of one of Brno’s major textile companies and the family lived in middle-class comfort with servants and a governess for Kurt and his older brother, Rudolf, born in 1902. The young Gödel was known affectionately by the nickname, der Herr Warum (Mr. Why). In Logical Dilemmas: The Life and Work of Kurt Gödel, biographer John W. Dawson, Jr., describes him as “an earnestly serious, bright, and inquisitive child who was sensitive, often withdrawn and pre-occupied, and who, already at an early age, exhibited certain signs of emotional instability.” At age eight, after reading a medical book, Gödel became convinced that he had a weak heart, a possible complication of the rheumatic fever that he had recovered from at age six. Hypochondriac concerns for his health would become a lifelong preoccupation. In 1923, Gödel enrolled in the University of Vienna with the intention of studying physics. After attending lectures on number theory by the charismatic professor Philipp Furtwängler, brother of famed German conductor Wilhelm Furtwängler, he switched to mathematics. Furtwängler was paralyzed from the neck down and lectured from his wheel chair with an assistant writing his formulae on the board. He made an impression much like that of Stephen Hawking today. As a student, Gödel attended meetings of what would later become Der Wiener Kreis (Vienna Circle), a group of mainly philosophers who met to discuss foundational problems and who were inspired by Ludwig Wittgenstein’s Tractatus Logico-Philosophicus. The group focused on questions of language and meaning and logical relations such as entailment, and originated Logical Positivism. Led by Moritz Schlick, a professor at the University who was later murdered by a deranged former student as he climbed the steps to the main lecture hall (1936), its members included Rudolf Carnap, Otto Neurath, Carl Hempel, Hans Reichenbach, and others. 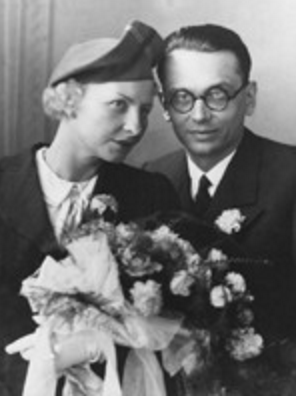 Kurt Gödel and Adele Porkert were married in Vienna in 1938. In 1927, at age 21, Gödel met dancer Adele Nimbursky (née Porkert), in the Viennese night club, Der Nachtfalter (The Moth). Because Adele had been married and was six years older than Kurt, his parents disapproved of the match (his mother Marianne was 14 years younger than his father, Rudolf). This was the second time they had disapproved of Kurt’s liaison with an older woman and it was not until the autumn of 1938 that Kurt and Adele were married. Gödel pursued studies in mathematics and logic with Hans Hahn and Karl Menger. His doctoral thesis was completed in 1929, the year in which his father Rudolf died, leaving the family in comfortable circumstances. Gödel’s mother bought an apartment in Vienna where she lived with both of her sons and enjoyed the cultural life of the city, especially musical theater. Gödel developed a lifelong love of operetta. After receiving his doctorate, Gödel became a privatdozent (unpaid lecturer) at the University of Vienna. Like many of the young scholars who later found their way to the Institute for Advanced Study from Europe in the 1930s, Kurt Gödel was brilliant. Unlike many, he was not Jewish, although he moved in circles of Jewish intellectuals and was sometimes thought to be Jewish. He had once been attacked as such by a gang of youths while walking with Adele on a street in Vienna. During the 1930s it was not unusual for university students who were Jewish or had socialist leanings to be forcibly removed from classes. Many of Gödel’s contemporaries were fleeing Europe. In 1931, Gödel published results in formal logic that are considered landmarks of 20th-century mathematics. Gödel demonstrated, in effect, that hopes of reducing mathematics to an axiomatic system, as envisioned by mathematicians and philosophers at the turn of the 20th century, were in vain. His findings put an end to logicist efforts such as those of Bertrand Russell and Alfred North Whitehead and demonstrated the severe limitations of David Hilbert’s formalist program for arithmetic. By the age of 25 Kurt Gödel had produced his famous “Incompleteness Theorems.” His fundamental results showed that in any consistent axiomatic mathematical system there are propositions that cannot be proved or disproved within the system and that the consistency of the axioms themselves cannot be proved. 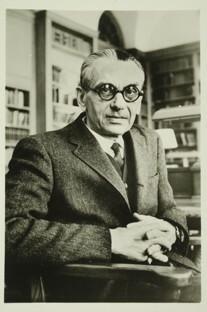 In addition to his proof of the incompleteness of formal number theory, Gödel published proofs of the relative consistency of the axiom of choice and the generalized continuum hypothesis (1938, 1940). His findings strongly influenced the (later) discovery that a computer can never be programmed to answer all mathematical questions. In 1938, Gödel’s application for a paid position at the University of Vienna was turned down. Fearing conscription into the German army, he applied for a visa to the United States. In late 1939, Kurt and Adele fled Nazi Germany, traveling via the trans-Siberian railway and ship to San Francisco, where they arrived on March 4, 1940. They settled in Princeton where Gödel’s position at the Institute was renewed annually until 1946, when he became a permanent Member until appointed to the Faculty. When Gödel became convinced that he was being poisoned, Adele became his food taster. His digestive ailments and, particularly, his refusal to eat led ultimately to his death on January 14, 1978. He died in Princeton at age 71 and is buried in the Princeton Cemetery. One of the most significant acknowledgements of Gödel’s accomplishments came in 1974, when he received the National Medal of Science in the discipline of mathematics and computer science from President Ford in a ceremony at the White House. 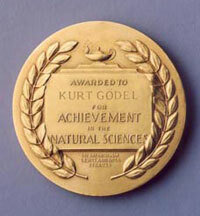 Prior to the National Medal of Science, Gödel received the Institute’s Einstein Award in 1951, which consisted of a gold medal (pictured) and the sum of $15,000. 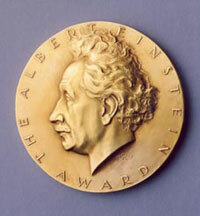 The gift of Institute Trustee Lewis L. Strauss, it was presented to Gödel by Einstein at a ceremony in Princeton. Following this award, several other accolades came to Gödel, including honorary doctorates from Yale, Harvard, and Rockefeller universities and from Amherst College. Gödel was a Member of the National Academy of Sciences of the United States, a Foreign Member of the Royal Society of London, a Corresponding Member of the Institut de France, a Corresponding Fellow of the British Academy, and an Honorary Member of the London Mathematical Society.